If your child is participating in organized sports or other recreational activities, a mouthguard (or sports guard) is an essential piece of athletic gear that should be part of his or her standard equipment. Sports guards are important, because when used correctly, they cover the upper teeth and help cushion a blow to the face, minimizing the risk of broken teeth and concussion. STOCK | These are inexpensive and come pre-formed, ready to wear. Unfortunately, they often don’t fit very well. They can be bulky and can make breathing and talking difficult. BOIL & BITE | These mouth protectors can be bought at many sporting goods stores and drugstores and may offer a better fit than stock mouth protectors. They are first softened in water (boiled), then inserted and allowed to adapt to the shape of your mouth. CUSTOM FITTED | These are made by us for you personally. They are more expensive than the other versions, but because they are customized they usually offer the best fit. 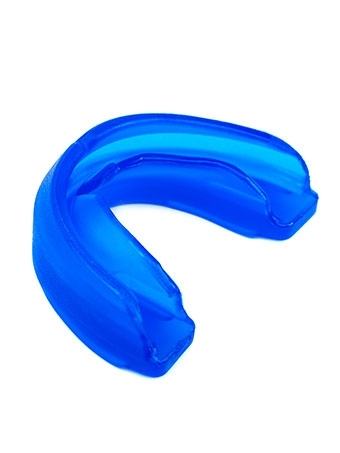 The best mouthguard for your child is one that has been custom made for him or her. However, if you don’t get a custom-fitted mouthguard, you should still consider wearing a stock mouthguard or a boil-and-bite mouthguard from the drugstore. A properly fitted mouthguard may be especially important for people who wear braces. A blow to the face could damage the brackets or other fixed orthodontic appliances. A mouthguard also provides a barrier between the braces and your cheek or lips, limiting the risk of soft tissue injuries. Mouthguards are a great way to prevent dental emergencies from occurring. To learn what to do in case of a dental emergency, click here.